How often do you think about your skin? Most of us consider it daily — how to make it look brighter, healthier, and more youthful or how to cover it up. And while most people think that beauty is only skin deep, more and more beauty magazines are going beyond that, celebrating what it means to be women of different skin tones. 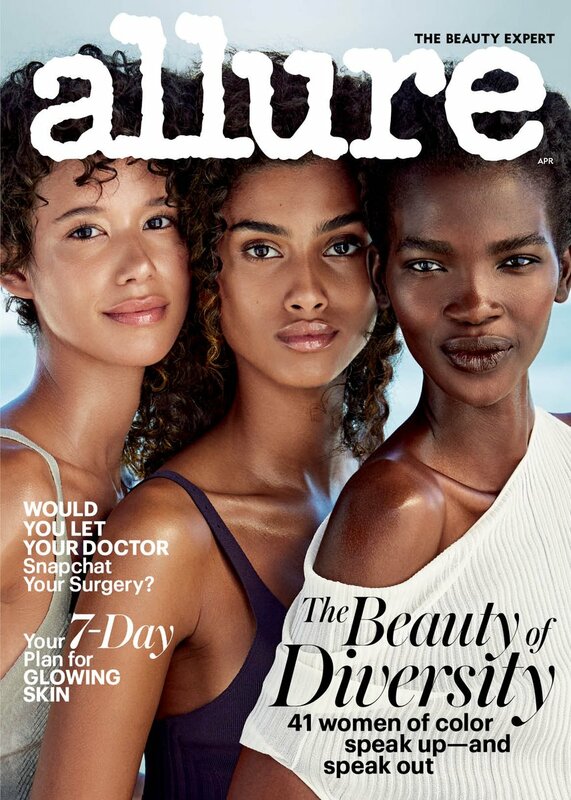 Case in point: Allure's Women of Color cover, which highlights the beauty of diversity, and asks 41 women of color to speak up, and out, about their skin. "Our skin...defines how we're seen...and how we see ourselves," Allure said in its April 2017 cover story. They asked "women of color to tell us the story of their lives through their skin — and skin tone. Because our skin can be both a vulnerability and a defense. But most importantly, it can be a source of celebration." Supermodels Dilone, Aamito Lagum, and Imaan Hamman grace the cover in monotone swimsuits, gold accessories, and fresh-for-summer minimal makeup looks. They discuss the influence their skin, heritage, and appearance had on their childhoods and careers. The dozens of women also featured, from actors to journalists and dermatologists, chime in on colorism, visibility, duality, and beauty. This cover is extremely important for a few reasons. Women of color are underrepresented in the beauty industry, denied the kind of media representation, scientific research, product access and diversity, and service afforded to white women. Plus, it's time to celebrate all kinds of women more. When we see (and appreciate) the diversity of all women, all women are empowered to embrace their individual beauty. Props to Michelle Lee, Allure's EIC. It's more than just a beautiful cover. But it wouldn't be Twitter without a little shade. Readers are definitely taking note of which covers are actively working toward inclusion, and which aren't. Vogue did their best "diversity" cover in March, featuring seven different celebrities — and not a single dark-skinnned woman of color. It did not go over well. Plenty of Allure's critics are chiming in, too, hashing it out with the magazine's Editor In Chief Michelle Lee. While not everyone agrees, one thing is for sure — Allure's cover is sparking much needed conversation and it's a step in the right direction.